Have You Been Saved Lately? ~ Android Forever! Have You Been Saved Lately? I have mentioned this tip before in passing, but since I think you might have missed it, I present it here alone and unfettered. One of the most basic computing necessities I know of is the imperative to SAVE YOUR WORK AND SAVE IT OFTEN! Sorry for yelling, but I'm passionate about this. 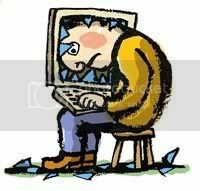 People who neglect to save their work and save it often will inevitably encounter an ill-timed computer crash or freeze-up, the result of which will be the irretrievable loss of hours of creative (or not) labor. It's happened to me, and I'll admit, I wanted to crush my machine into powder. I didn't. Instead I faced the disheartening fact that I would have to recreate what I had just spent a goodly amount of time and effort to create the first time. "But," you say, "saving is such an odious chore!" Only if you do it the hard way. I'm going to reveal to you the easy way that quickly becomes an indelible habit (one of the god ones). What you do is, hold down the Ctrl key while hitting the S key. It's a simple two-finger operation. When you begin a new document, hit Ctrl-S. Give your file a name and a place to live. From then on, after every few minutes of work on the document, do another Ctrl-S. You'll never lose more than a couple of minutes of work if you do this. Someone will of course point out to me that MS Office applications auto save every 10 minutes. Yes, they do. Except when they don't. And 10 minutes of work can be a lot. And the auto save feature can slow down your work every time it runs. No, it's better to get into the habit of doing it yourself.